South Florida Theatre Scene: Buffman's Back with BBC Murder Mysteries. 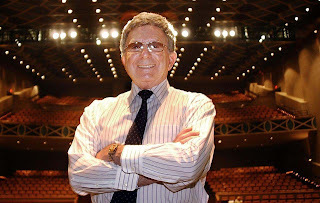 Zev Buffman is one of the visionaries who helped lay the groundwork for today's theatre scene in South Florida. And after a decades-long absence, he's back with Agatha Christie's The BBC Murder Mysteries at the Parker Playhouse, an eminently newsworthy event that can't wait until your Monday reading list. South Florida impresario and veteran Broadway producer Zev Buffman foresees a future for stage theater — in radio. Not just for any theater, but orphans like the Parker Playhouse that are too big for local theater troupes and too small for Broadway tours. And he wants to do it in part by reviving the genre of mystery/thriller plays. Local audiences will see his first foray this month with his production of Agatha Christie’s The BBC Murders, four radio plays lost for a half-century, uncovered by Buffman’s detective work and adapted by grafting full-fledged theater techniques onto a vintage radio drama foundation. The show features 20 actors, musicians and Foley artists including Gary Sandy, a seasoned stage actor best known for TV’s WKRP in Cincinnati; Phil Proctor, a founder of the counterculture comedy troupe Firesign Theater; actress/singer Amy Walker whose UTube video features her performing 21 accents in two minutes; Proctor’s wife Melinda Peterson impersonating Christie herself as the hostess and narrator, plus local actresses Elizabeth Dimon and Angie Radosh. From his 1962 debut with Pajama Tops at the Coconut Grove Playhouse until 1988 when he handed off his theatrical ventures to the company that became Broadway Across America, Zev Buffman was the dominant force in South Florida theater, not to mention a producer of Broadway shows and touring theater fare. Buffman hopes that the unusual hybrid art form that is The BBC Murders will launch an ongoing relationship involving Clearwater’s Ruth Eckerd Hall, which he heads; the restored Capital Theatre in Clearwater; and the Parker, where his 21 years as the theater’s producer included Elizabeth Taylor’s 1981 stage debut in The Little Foxes. Buffman, who gave the cast a Parker Playhouse tour that proved emotionally intense for him, says he’s excited about reentering a world that could, perhaps, take him back to Broadway. Mr. Buffman has a record of producing hit productions; let's hope he hasn't lost his touch. Welcome back, Zev!